modo's newest hybrid: 2013 prius plug-in! Thanks to The Province’s Keith Morgan and Toyota Canada for helping us commemorate the first fob-in for Modo’s newest addition to the Prius family, the 2013 Toyota Prius Plug-in! 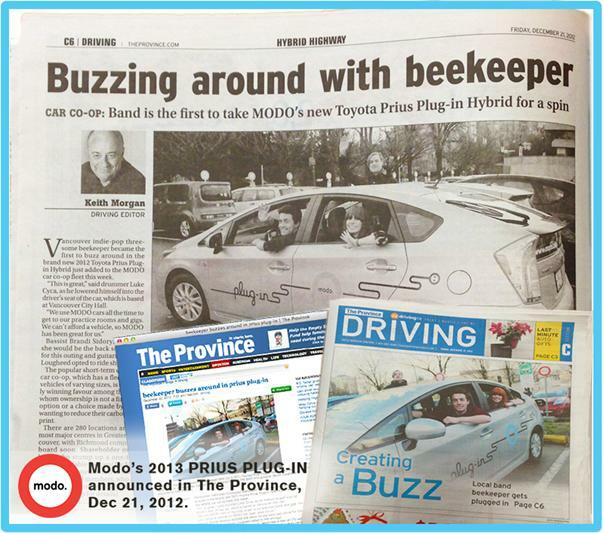 Modo members from the band beekeeper took the hybrid for its inaugural spin on December 18. Says drummer Luke Cyca: "beekeeper has been driving Modo cars for over three years. When we need to get to a show or the studio with a bunch a music gear, we can either beg a beat-up car from a friend, rent a car for a hundred bucks and forget to fill it with gas afterwards, or just walk a half-block to the nearest Modo car. The choice is clear: Modo every time." 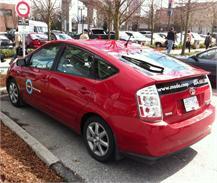 Vehicle #419 - 2013 Silver Toyota Prius Plugin is currently a floater vehicle at the Main Street Skytrain station lot. Look for our announcement about its permanent home soon! See beekeeper perform live February 9 at the Biltmore. As well, the band is offering a free download of its first album, BE KEPT, to Modo members; enter "GOMODO" at http://download.bkpr.ca for a complimentary copy. modo now covers bridge tolls! As of December 1, tolls are now included in our regular pricing for trips over both the Port Mann and Golden Ears bridges. Enjoy! The "Double Action" emergency brake is typically located to the left of the brake pedal. To set, press the pedal part of the way down; to release, press the pedal all the way down and it should pop up. Note: The ( ! ) light at Dash Information Display should go out once the emergency brake is fully released. Many members have, rightly, wondered what the hold up is on Modo's expansion into Richmond. The City of Richmond approved and is now making adjustments to a new parking bylaw to allow carshare vehicles to park in specific spots near public transit hubs. Modo fleet director Doug Dunn reports that the Richmond vehicle will soon be placed near either Cook and Buswell, or Park and Buswell. Look for our announcement in the coming months. Posted speed limits are designed for ideal road conditions. Slow down when driving on snow, ice, slush or rain. Allow yourself at least twice the normal braking distance on wet or slippery roads. Avoid driving through flooded or washed out roads. Use extreme caution when approaching highway maintenance equipment including plows, salt and sand trucks. Never pass on the right. 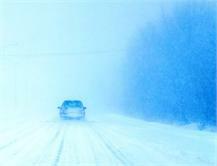 Low beams are more effective in fog or heavy snow. Check tire pressure regularly. Pressure drops in colder conditions. Keep the wiper fluid topped up for clearer visibility. Keep your gas tank full to prevent gasoline from freezing in extreme temperatures. 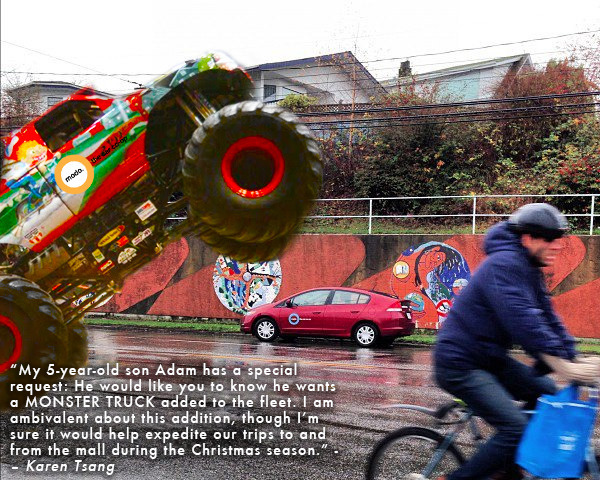 What if my Modo vehicle gets stuck in the snow? Clear away the snow from around the tires to allow the wheels to roll more freely. If you've something to help increase traction (such as traction mats, old carpets, salt, sand or kitty litter), put it right in front of the drive wheels. Gently rock the vehicle back and forth by shifting from forward to reverse, gradually increasing the distance you've moved with each rocking motion. Refer to the owner's manual for more information. How can I regain control if the vehicle skids due to black ice? Skids can happen any time your tires lose grip on the road. If you drive over black ice and your vehicle starts to skid, ease off the accelerator, and look and steer smoothly in the direction you want to go. Don't brake, as this will make the situation worse. You may need to repeat this manoeuvre several times until you regain control. Is 2013 the year you step up your membership with Modo? Board elections will be held at our Annual General Meeting, January 24, 2013. We'll be electing two (out of eight) new directors for a three-year term of office. All co-op members are eligible to run. Learn more about what is required of a Modo director and find nominations materials on our website. The deadline to apply is January 3. Shareholding members can look for a message in your inbox on January 10 announcing how to access bios and info about this year's board nominees! Our AGM is coming up soon! All are welcome, though only co-op members may vote. Come meet Modo's sitting directors Alan Woodland (Chair), Joel DeYoung, David Lach, Beth Breisnes, Ned Georgy, Maureen Collier and Yasuhiko Ogushi as well as those running for a seat on the board. Afterwards, walk across the street to our offices, where we'll be hosting a casual post-AGM get-together, with food, beverages, music and opportunities to get to know fellow Modo members better! Sharing is addictive. First, you share the road, and pretty soon you’re sharing... everything! 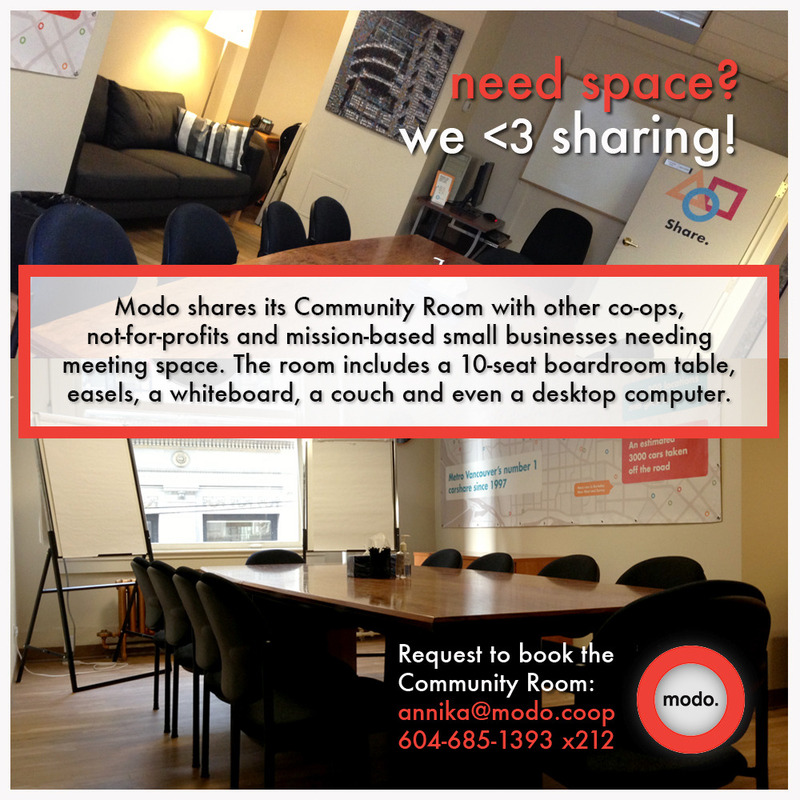 To book the Modo Community Room, email or call our office manager Annika at annika@modo.coop / 604-685-1393, ext 212. When you are doing your walkaround before you fob into your Modo vehicle, please ensure you also check the rear/hatch/trunk when doing your inspection. We find that this is sometimes forgotten and should be included as part of your visual inspection. Inspect for (and report) any scratches and dents that haven't been stickered, as well as, of course, a missing license plate or license plate decals. In case you aren't already hooked into Modo's social media channels, be sure to Like us on Facebook, Follow us on Twitter and Tumblr, and subscribe to our Youtube channel for impromptu contests, ticket giveaways, updates on our fleet and a choice aggregation of news from around the web regarding carsharing, co-ops, transportation and local goings on. Main St. Community Mapping: Help make a community “transition” map of Main St, using a physical map and eventually posting it to the internet. Canning & Seed Exchange: Bring something you've canned, seeds you've saved or food you've grown, and exchange it with others! Tuke and/or Scarf Swap: It's cold and it's Canada; bring a tuke and/or scarf to swap. ** Look for upcoming special ticket giveaways for Modo members through our Facebook and Twitter! Deepen your Modo membership by participating in our AGM, where we'll review the past year for the car co-op and elect two new directors to our board. Afterward, all are invited for our after-party, with food, drinks, music and hi5s! Find vehicle #404, a 2012 yellow Fiat 500, in its new home. We have abandoned our old location at Collingwood & W 16th. The 2005 Toyota Echo has been upgraded to a new 2012 green Mazda 2 hatchback (vehicle #421). The 2007 Hyundai Sonata has been upgraded to a 2013 silver Nissan Sentra (vehicle #420). Our new 2013 silver Toyota Prius Plug-In (vehicle #419) will be living here temporarily until the charging infrastructure is ready in its anticipated permanent home in the City Hall Surface Lot. 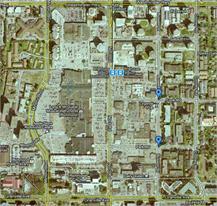 Find the Sitka Co-op vehicle (#424), a 2010 red Nissan Cube, on Woodland between Graveley and Grant. The 2005 Toyota Echo has been upgraded to a new 2012 green Mazda 2 hatchback (vehicle #422). The 2007 Hyundai Sonata has been upgraded to a 2012 grey Toyota Matrix (vehicle #423). The 2008 Dodge Grand Caravan has been upgraded to a 2010 red Dodge Grand Caravan (vehicle #320).